Drumlin Farm relies on the energy and hard work of our many volunteers to accomplish our goals . 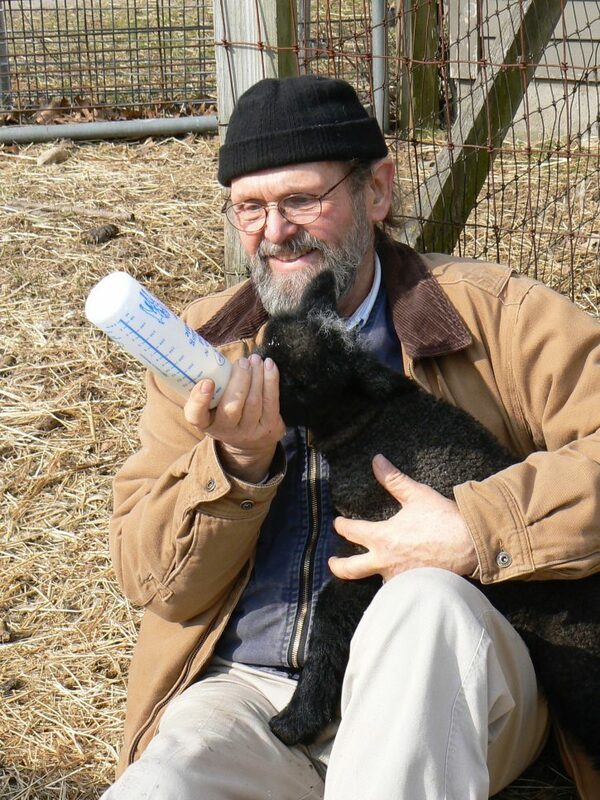 In recognition of the importance of this vital community, the Drumlin Farm Sanctuary Committee recently initiated the Jonathan Leavy Award for Outstanding Volunteer Contributions. Jonathan, a long-time livestock volunteer who passed away in 2016, and whose smile and friendship are sorely missed, diligently cared for our animals while using his impressive carpentry skills to make improvements to our barns. On September 23, at our Moon Over the Drumlin benefit dinner, we presented the first annual award in Jonathan’s memory to Fred Costanza. Fred has dedicated more than 14,000 hours of his time and hard work to Drumlin since 2006. He is a multifaceted volunteer who assists staff in caring for our livestock, crops, and property. 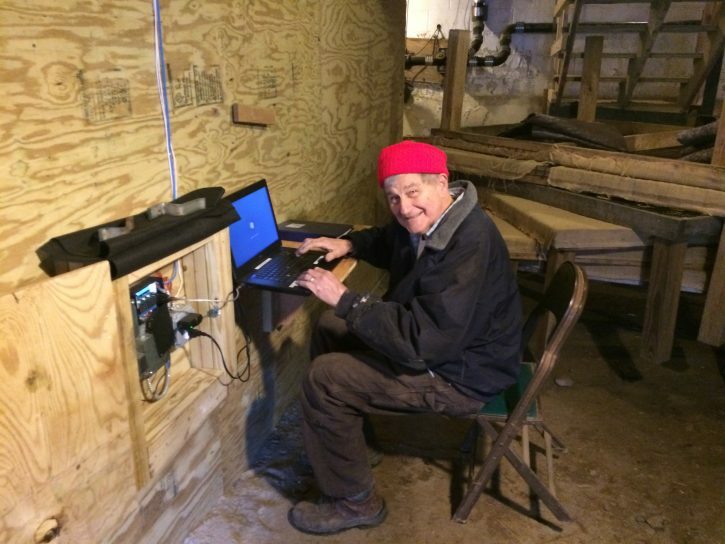 On any given day you can find Fred plowing a field, programming the root cellar cooling system, fixing a tractor, mucking a barn, feeding the goats, or lending a hand at a special event. Our staff turn to Fred not only for help with the everyday tasks that keep the sanctuary running smoothly but also for behind-the-scenes projects that we have come to rely on him for. Need a fence repaired, maintenance for the crops truck, a mobile chicken coop relocated, or someone to man the giant spider at Tales of the Night? Call on Fred. The Jonathan Leavy Award plaque can be found in the tack room of our red barn—a fitting location where much of Jonathan’s handiwork can be found. Fred’s name is engraved upon it as the first recipient. Thankfully, his name will be joined by other wonderfully generous Drumlin Farm volunteers in the years to come. 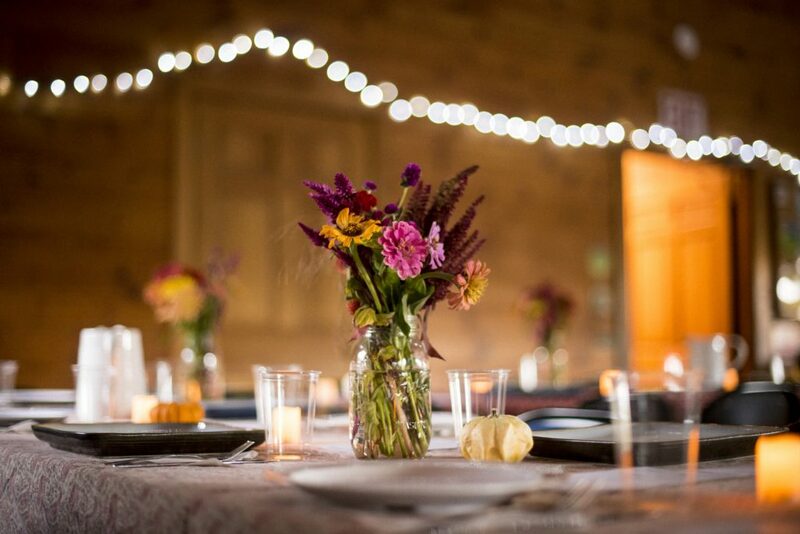 This entry was posted in Volunteers and tagged drumlin farm, volunteers on October 18, 2017 by Staff. Frosty fields on Sunday and Monday morning put an end to the husk cherries for the season and blackened leaves on summer squash, string beans, and sweet potatoes. Because the tomatoes are upright on their trellises and away from the cold ground, they have escaped damage and continue to ripen fruit. On Saturday afternoon, the predicted cold forced us to protect baby greens with row cover supported by metal hoops. Row cover can lay flat on a crop when its purpose is insect exclusion, but in order for it to add a few degrees of warmth to the air beneath it, it needs to be floating above the ground. And while baby arugula and spinach can withstand light frosts, you can’t harvest frozen leaves—they turn to mush off the plant, but will thaw and continue to grow if uncut. While we were working with row cover in dry and windy conditions at the farm, it poured on the market team in Somerville. But market-goers know that summer produce will soon be gone, and sales were strong despite the rain. On Monday morning, we again delivered an assortment of tomatoes, peppers, and greens to the Somerville schools, and hope to do that again next week before frost finally takes the nightshades. Check out the video describing our partnership with Somerville Schools. Thanks Emma, Ian, and Mimi for your great work putting it together. We need to be harvesting into the root cellar so that we aren’t caught with too much to do and no time to do it, but the summer crops keep demanding our attention. Volunteer groups that normally help us dig sweet potatoes at this time of year, have been pulling broad-leafed weeds (normally zapped by frost by now) and harvesting other crops. On Tuesday, a group from Ecova, a Boston energy management company, returned to volunteer for the second time this season. After weeding through the strawberry patch, the volunteers helped us harvest over a ton of tomatoes—the biggest tomato harvest I’ve experienced at Drumlin. 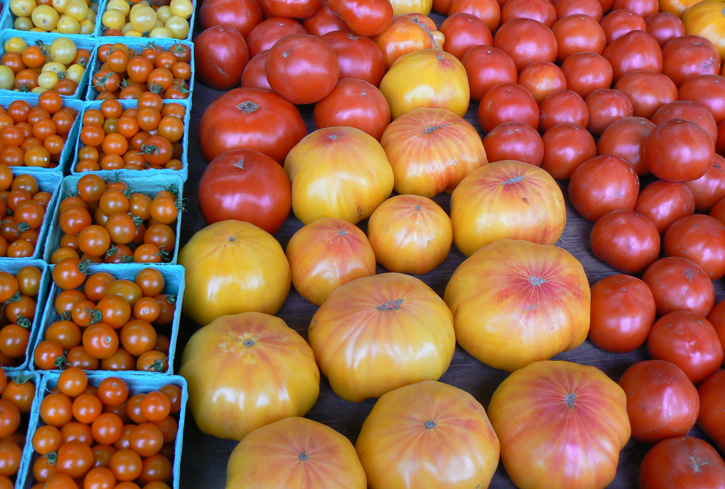 Thanks to the Ecova volunteers, each CSA member received about 20 pounds of tomatoes the following day! And thanks to the CSA members for helping us make good use of this season’s incredible harvest. Last Thursday, four volunteers from Intel helped us pick beans, peppers and eggplant in preparation for the farmers’ market. Our Friday market harvest still lasts until dusk, so it’s a huge help to get some of the work done on Thursday afternoon. Thanks, Intel. This entry was posted in Farming on October 5, 2017 by Staff. Last week, two volunteer groups helped us start the fall harvest process. Volunteers from Ecova weeded strawberries before clipping and crating the spaghetti and orange kabocha squashes—two early varieties that are ready for eating. Volunteers helped us carry the squash into the greenhouse while others picked string beans for Saturday’s market. Volunteers from the Appalachian Mountain Club helped us weed carrots and summer squash and harvest more beans and squash. The volunteers were so engaged with the weeding that many could not be enticed out of the carrots with the promise of a harvesting job or even with watermelon slices! Thanks AMC for your help this season and for picking all those beautiful beans. This week Mary Eagan and Emily Poma joined the team. Mary will be helping out wherever more hands are needed: such as this past Friday’s market harvest, when she and Andrew loaded most of the watermelons. Emily is from Italy and first came to the fields during a Saturday open volunteer session. It soon became clear that she had worked on farms before, and we are very happy to have her on the team. The first succession of watermelons and cantaloupes is at an end. We have another round coming, but today and tomorrow at the stand you’ll find the last melons for a little while. 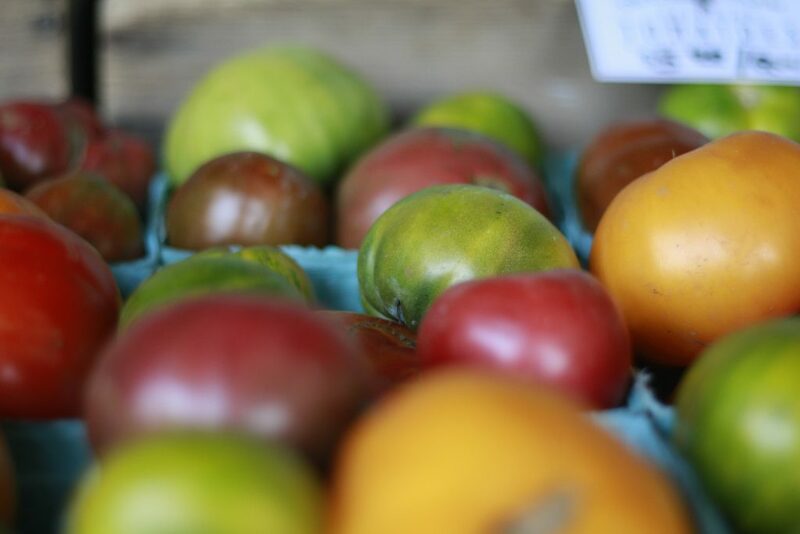 Tomatoes are ripening quickly now, and we should have a good selection available every day from now until first frost. Get the summer favorites while you can—it feels like we’re headed for an early frost. This entry was posted in Education, Farming on August 29, 2017 by Staff. 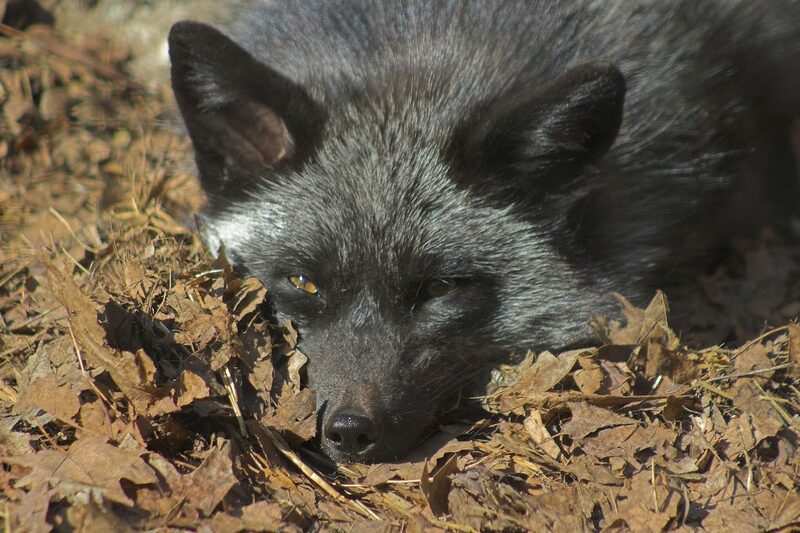 After 11 years as an animal ambassador at Drumlin Farm, our silver-phase red fox is retiring. He will live comfortably in our Wildlife Care Center, where our staff will take care of him for his remaining days. We’d like to take the time to tell you a little bit more about his story. Our fox has been with us since January 2006, and he has proudly reached his retirement age of 13 years old. He was originally brought into wildlife rehabilitation in 2004. He was underweight, emaciated, and suffered from seizures. The owner, who had bought the fox to keep him illegally as a pet, left wrong information and disappeared. After almost two years of constant care by a certified wildlife rehabilitator, the fox was back to health and needed a permanent home having never learned how to survive in the wild. Drumlin Farm was happy to introduce the fox to the Drumlin Underground exhibit where the fox lived, at times, with another red fox. Wildlife Care staff noticed the first signs of age-related decline two years ago and has been monitoring the fox ever since. We had hoped that having a new home at the New England Wildlife Explorations exhibit would have eased some of his age-related ailments, but time seems to have taken a toll on the fox. So now, after 11 wonderful years as one of our animal ambassadors, the fox will move to a new quiet retirement enclosure in a section of the farm closed to the public. The fox joins a crew of retired animals that include our oldest animal, the 42-year-old (at least!) turkey vulture that joined the farm in 1977 when he was already at least two years old. Healthcare benefits for the captive wildlife at Drumlin Farm are very good. It’s free, enrichment is given regularly, and delicious meals are provided to all residents. Retirement is also part of the benefits package. Retirement age varies depending on the species, but a comfortable and quiet retirement home is planned for all. 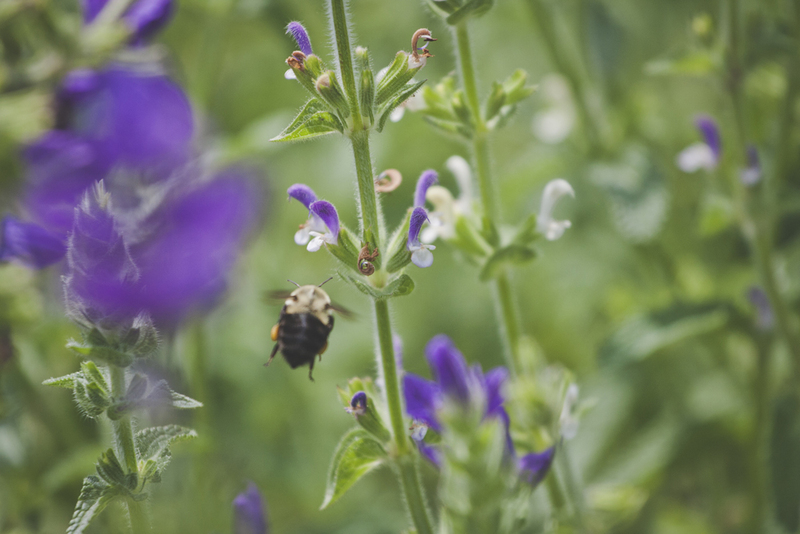 Drumlin Farm is home to more than 70 wildlife animals, representing 37 species native to New England. These animals are non-releasable due to physical or behavioral challenges that prevent them from being competitive in the wild. Some of the animals are unable to capture their food, or escape a predator, and some never learned the social cues needed to interact with members of the same species. Young, healthy animals help our teachers in fulfilling Mass Audubon’s mission of protecting the nature of Massachusetts. Older animals, starting to show signs of physical decline, move into the Wildlife Care Center for retirement. We don’t purchase our animals, but rather provide a good home to wildlife in need that cannot survive in the wild. We hope to fill the New England Wildlife Explorations exhibit soon with another fox. We have been in the process of finding a companion for our silver-phase fox, and as I write, we have a solid lead on two red foxes that might join the Drumlin Farm family soon. We’ll announce their arrival on Facebook! Until then, we here at Wildlife Care want to thank our fox, and our visitors, for a great 11 years. This entry was posted in Uncategorized on August 22, 2017 by Staff. 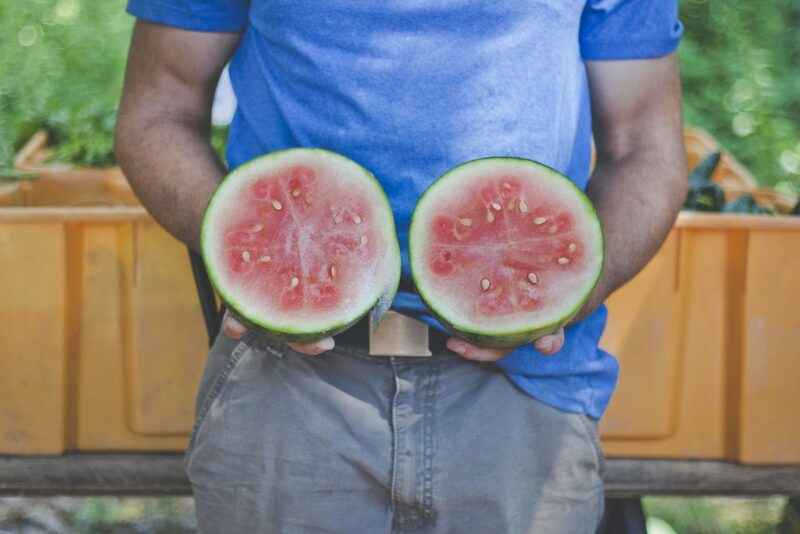 At the farm stand you will find the pink-fleshed, thin-skinned Little Baby Flower watermelon. It’s no sugar bomb, but the words I use to describe it are “refreshing,” “tangy,” and “yes.” Also, try biting into the rind just below the flesh; it’s good eating. We’ve taken serious measures to protect the watermelons. An electric fence keeps out coyotes and Mylar flash tape wards off crows. They’ve taken to attacking our radicchio (some of which look more like chopped lettuce than the typical mini cabbage). I can’t imagine what the crows are getting out of the radicchio except the satisfaction of knowing most people don’t like it. On another farm, I saw crows dig up and peck apart freshly-planted garlic cloves; this in response to placing orchard netting over tomatoes to keep them out. So, crows—tricksters or vengeance-minded gangsters? It’s clear why a group of crows is called a murder! The deer are also starting to eat carrots and take bites out of spaghetti squash. At least that makes some sense. We just wish the deer would eat all of one squash instead of taking small bites out of several. Last Tuesday was the last of the summer’s Weed-outs. The groups cleared weeds from the main leek and potato patches. 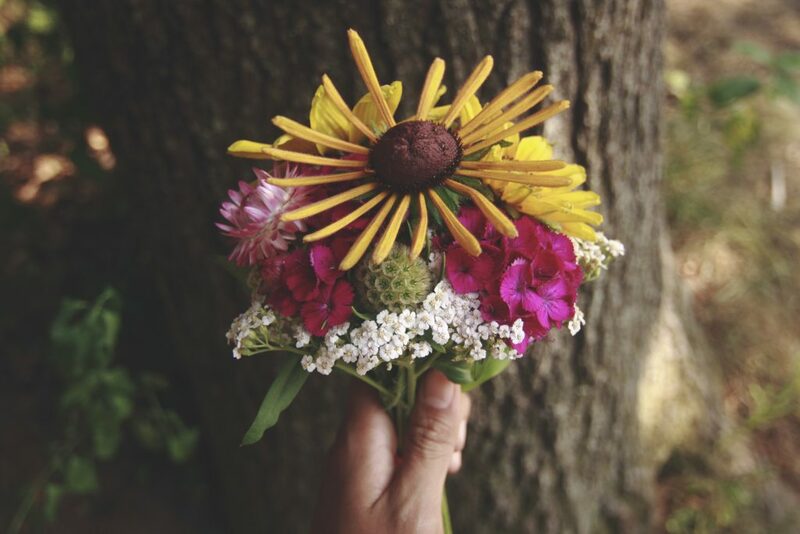 We are so grateful to Drumlin Farm Camp for making Weed-out a part of each session. Last week, another volunteer group from Global Atlantic Financial weeded and harvested potatoes and over 75 pounds of string beans. 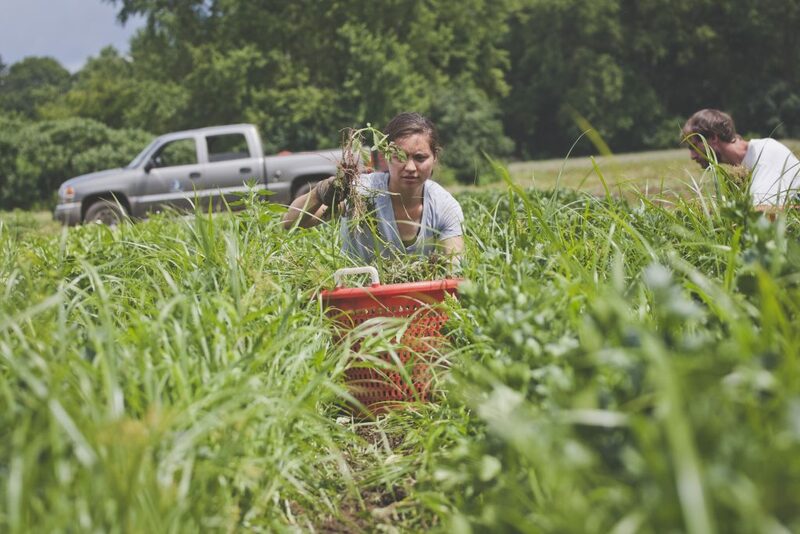 Because of their work, we were able to offer string beans to all CSA members the following day—a first! The public relations firm Denterlein Worldwide brought their whole staff of twenty people to the fields. They weeded carrots and fennel, and picked beans and carrots for market. Thank you, Denterlein volunteers. This is Jill Banach’s last week as part of the Crops Team. She needs to get ready for her senior year at UMass. Jill is even-keeled and reliable, and we’ll miss her in the fields and at the wash station where she proved herself to be equal to all we asked her to do. Thanks, Jill, and best wishes for the year ahead! This entry was posted in Education, Farming on August 9, 2017 by Staff. Volunteers from Global Atlantic Financial Group came eager to work. The oat straw mulch in our tomatoes, advertised as clean and seed-free, has been sprouting oats that limit air flow and compete with our plants for nutrients and light. The Global Atlantic volunteers pulled up all the green oats and laid it down as more mulch, they then harvested and helped lay out the entire Bridger onion crop currently curing in the greenhouse, they then weeded carrots before harvesting over 500 pounds of potatoes—all in a little over two hours! Thanks so much for the great help. Sign up for one of three weekly volunteer sessions—Tuesday, Thursday or Saturday afternoons from 1:30–4. We have been getting great help during these open sessions—many high school students completing their community service requirements and even some master gardeners. 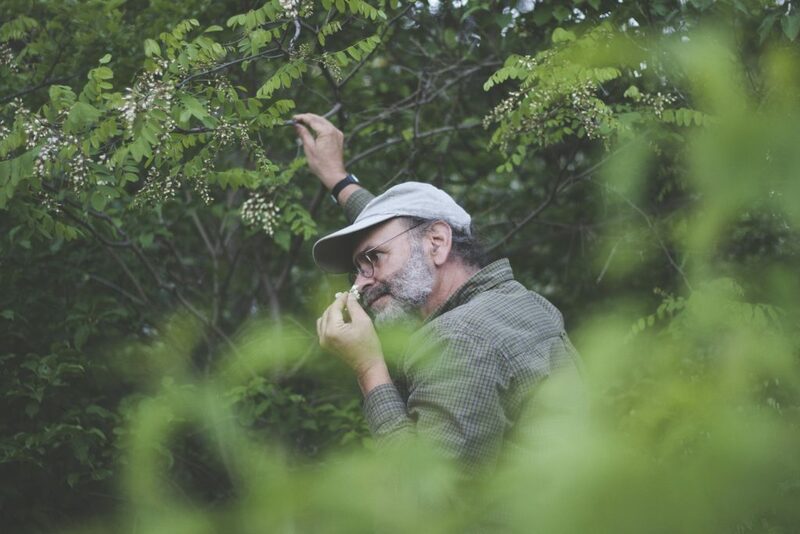 If none of these times work for you, email Matt at mcelona@massaudubon.org. Two Fridays ago the team was pleased to have the help of Sanctuary Director Renata Pomponi during the market harvest. Renata picked corn, bunched and topped carrots, and helped out in the wash station cleaning and packing veggies. Thanks, Renata! This entry was posted in Education, Farming on August 1, 2017 by Staff. At the stand, you will find cherry tomatoes and string beans. Both crops were harvested by our newest team members, Jacob Hunter (pictured above) and Bodhi Becker. 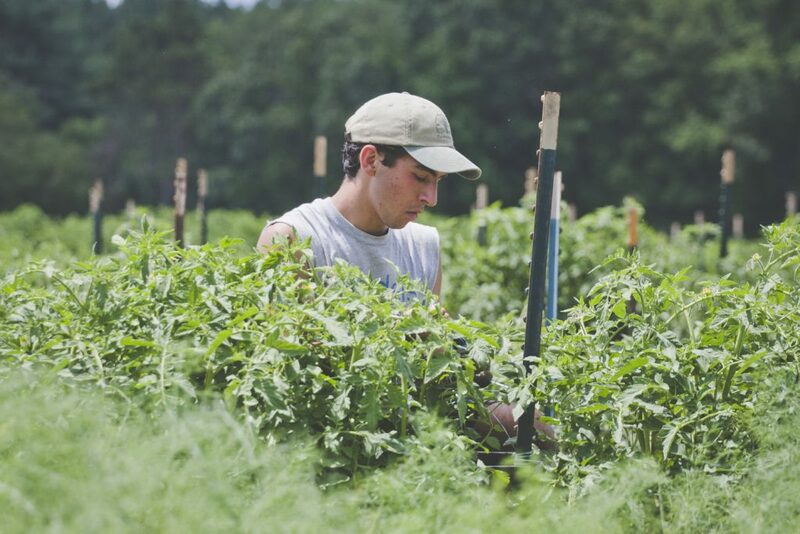 Jacob worked with us for a period last season when his tomato stringing skills earned our admiration. He will be with us for the next few weeks before starting his college career at Vassar. My nephew Bodhi, who will be a sophomore at Milton Academy in the fall, will be spending the rest of this week helping out the team. It’s a treat for me to get to spend time with him, and we love having the extra help. 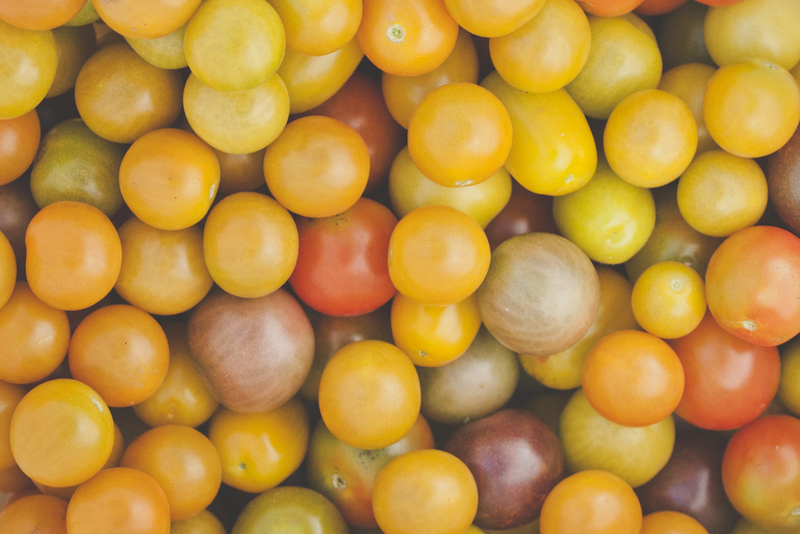 When Bodhi was a little taller than my knee, I remember him picking sungold cherry tomatoes in my father’s garden. This morning, standing several inches taller than me, he picked sungolds for you. Life is Sweet! And so is the corn. We have white corn at the stand and will be picking more for the CSA. The fence seems to be keeping the coyotes out, and the birds are having trouble drilling into the tight tassels of this variety—sugar pearl. This year, we finally cut trinity corn—a delicious, early, bi-color variety—out of the crop plan after years of trying to fend off the birds. So far so good. The gray weather is slowing down tomato ripening. We’re hoping to pick some slicers by the weekend, but that depends on the sun and the temperature. For now, we’ll have to satisfy our craving for color with yellow and purple beans, blue and red potatoes, and the lavender shades of eggplant. This entry was posted in Education, Farming on July 26, 2017 by Staff. Cherry tomatoes are nearly ready for harvest! Meanwhile, we’re continuing to harvest large quantities of eggplants, peppers, string beans, cucumbers, and summer squash. We’re also about to start digging blue and yellow potatoes in addition to the reds you’ve been seeing at the farm stand. The annual flower patch is getting colorful with rudbekia, snapdragons, amaranth, strawflower, zinnia, ageratum, and celosia. The bees are deafening in the cerinthe, a blue flower that droops its bells over. Fred and Sarah just finished putting an electric fence around the first planting of sweet corn as the coyotes seem to know where the sugar is and have started chomping it about a week before we’d want to do the same. But in general, all crops look great. Our biggest challenge right now is weeds. Camp Weed Out #2 just wrapped up – and at the perfect time. Thanks Emma, Jill and Laura for coordinating, and thanks to the campers and counselors for the help! Our garlic harvest failed last season, so you can imagine how happy we are to have a healthy crop this year. Last Thursday, investors from Athena Capital of Lincoln started the garlic harvest. Together we harvested three of our nine beds, or about 3,600 heads. Thanks to the Athena volunteers for making light work of what is usually a heavy job. This entry was posted in Education, Farming on July 19, 2017 by Staff. And tomatoes and peppers are not far off! Thanks to Emma, Jill, and Will for organizing Camp Weed-Out #1 last week, and thanks to all the campers and counselors who did such a great job weeding the brassica patch. On Thursday, accountants from Keurig Green Mountain weeded carrots, planted basil and lettuce, and harvested peas for market. Three of the Keurig volunteers are Drumlin CSA members, and it was nice to hear that they’ve been enjoying the peas in their shares. Avril, Andrew and Matt worked with 20 volunteers from the Appalachian Mountain Club (AMC). The group did some weeding and harvesting the first potatoes of the year. Thanks, Andy! A thunderstorm threatened but did not materialize, and we harvested 350 pounds of potatoes in about twenty minutes. The potato patch is looking great and promises to be seriously productive. Thanks to all those who took part in farming the fields this past week! This entry was posted in Education, Farming on July 11, 2017 by Staff.